Handcrafted elevator sneakers inspired by the urban style in blue suede, breathable perforated white fabric and grey calfskin details. 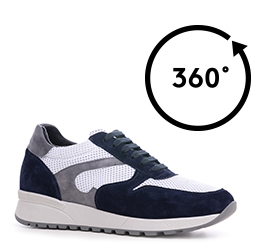 The grey sole is 100% natural rubber. A perfect combination of colours to enhance any casual outfits. The Capsule Collection by GuidoMaggi is distinguished by its sporty design, the refinement of the leathers and an inner elevator system able to increase height up to 3.1 inches.